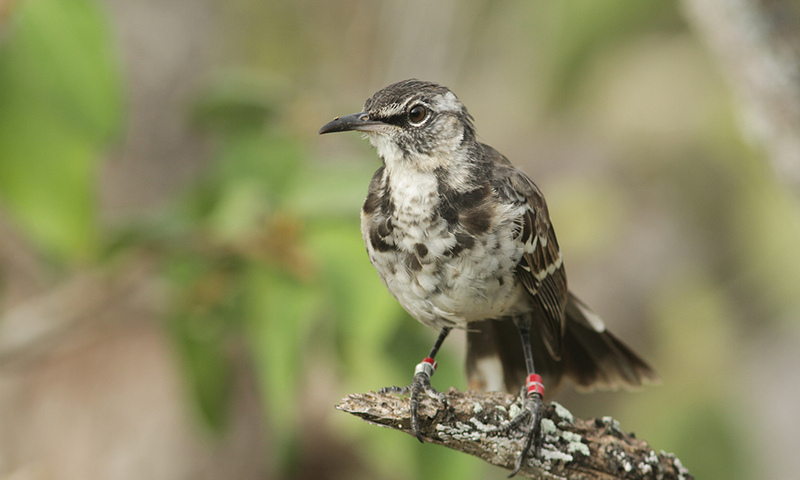 The Floreana mockingbird (Mimus trifasciatus) is the smallest of the four Galapagos mockingbird species. Extinct from its original home Floreana, due to habitat loss and predation from invasive species, it now only exists on two tiny islets nearby, Champion and Gardener. The project ultimately aims to reintroduce individuals from both islets back to Floreana, once the island has been restored to its former glory. During Charles Darwin’s visit to the Galapagos Islands in 1835, he noticed that each island seemed to have a different mockingbird species. 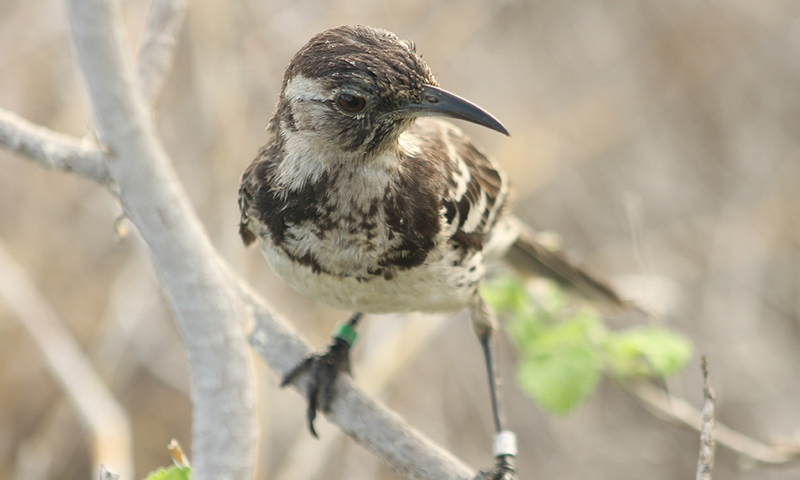 The specimens that he collected helped him to develop his theory of evolution and amongst them was the Floreana mockingbird from Floreana island. Sadly the Floreana mockingbird is no longer found on the island that gave it its name. 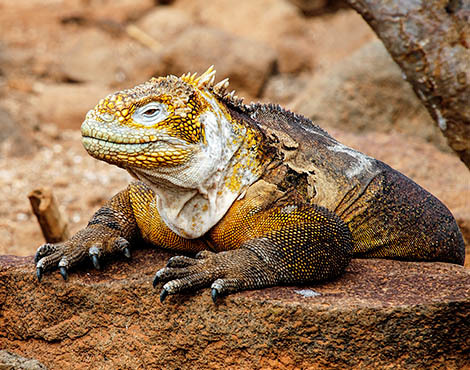 The species became extinct on Floreana in the 1920s due to habitat loss and predation by invasive species including feral cats, smooth-billed anis and invasive rats. 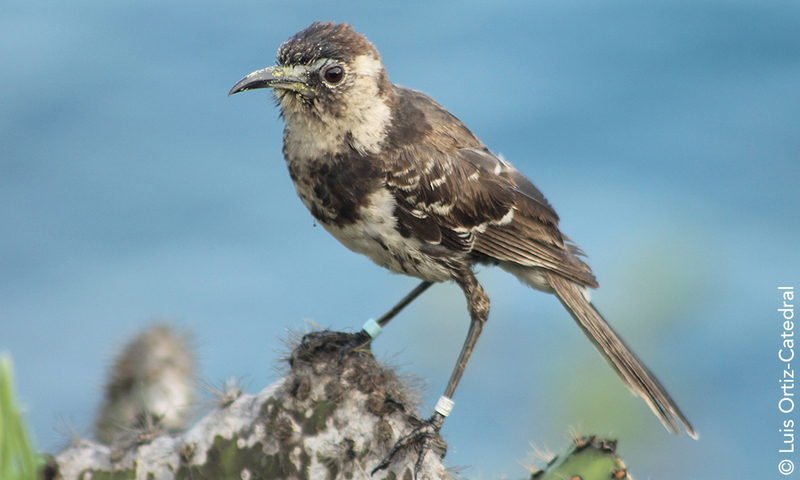 The global population of the Floreana mockingbird is now only found on two small islets off the coast of Floreana. Numbers fluctuate dramatically between 250-500 individuals, due to extreme weather events, and the species is currently listed by the IUCN as Endangered. Unfortunately, these two small islets, Gardner and Champion, are extremely isolated from one another. Previous research has suggested that the population on Champion is highly inbred and harbours valuable genetic diversity not found on Gardner (20km away), as these two populations have not been in contact for over 100 years. 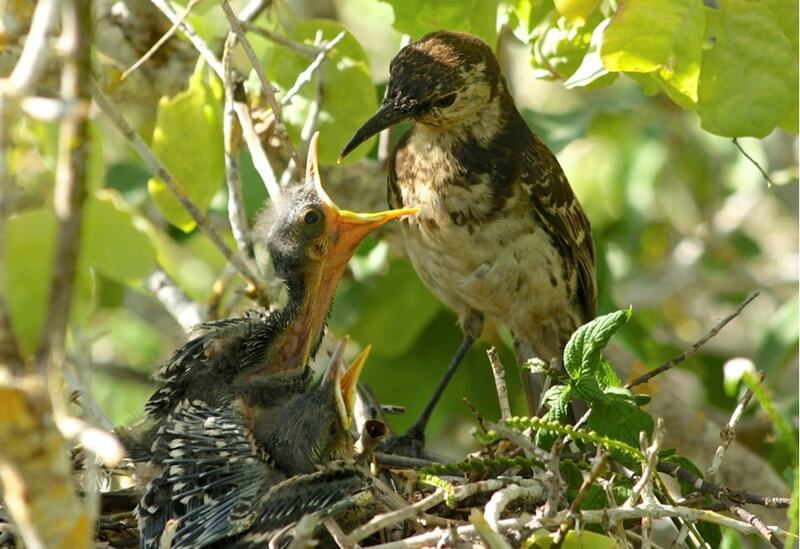 The Floreana Mockingbird Project aims to prevent further loss of genetic diversity as well as to reduce mortality including understanding why nests fail and how to reduce juvenile mortality rates caused by introduced species. The project undertakes annual counts on the known populations and works to quantify year-round habitat requirements with the ultimate aim of reintroducing them to Floreana. Overall, the project team, led by Luis Ortiz-Catedral, have detected that the population, although declining, is more stable than first thought. They have determined that the yearly fluctuations in numbers are closely linked to the amount of rainfall at the start of the breeding season. The two islets where the species is now found do not have rats and cats on them, and the invasive smooth-billed ani seems to have a negligible effect on the species’ numbers. Early investigations have also shown that the availability of Opuntia megasperma flowers during January-February is linked to chick survival and insect availability. Training rangers from the Galapagos National Park in field techniques to monitor Floreana mockingbirds. 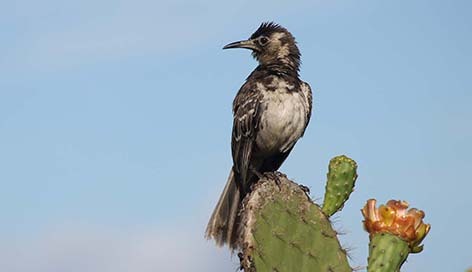 Characterisation of habitat requirements of Floreana mockingbirds on Champion and Gardner. Mapping of key sites for re-vegetation on the lowlands of Floreana Island. Undertaking behaviour surveys to ensure that family groups are not split during reintroduction. 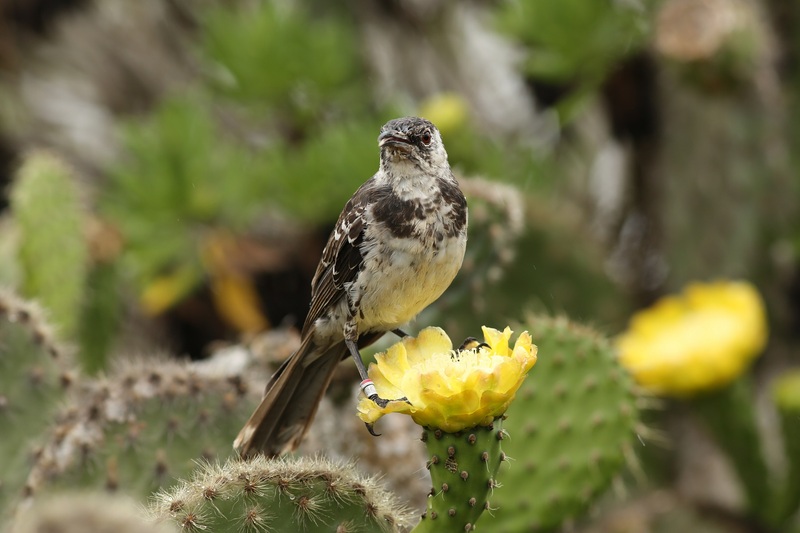 Please help us bring this Floreana mockingbird home by donating, adopting a Floreana mockingbird or joining up as a GCT member. Luis Ortiz-Catedral, lead scientist on the Floreana mockingbird, explains why supporting the project is so important.